Ernest McBride High School celebrated its grand opening recently with a ribbon cutting ceremony that included parents, students, staff, school district officials and members of the McBride family. The school is named after Ernest McBride, Sr., the late civil rights leader who fought segregation in Long Beach and co-founded the Long Beach chapter of the NAACP in 1940. “He dedicated his life to helping others,” said Ernest McBride, Jr., who earned cheers from the student body when he dubbed them “the wolf pack Class of 2017.” The students recently chose the wolf as the school’s mascot. The $75 million campus at Parkcrest Street and Los Coyotes Diagonal opened last month to a freshman class of 210 students. Each year, an additional class of ninth graders will be added until the school reaches an enrollment of about 1,000 ninth through twelfth grade students. McBride’s curriculum includes California State University and University of California entrance requirements, with an added emphasis on real-world training in three high-demand career pathways: Health and Medical, Public Services and Forensics, and Engineering. Built on the former site of DeMille Middle School, McBride is the first of several small high schools planned as part of the Measure K construction and renovation program. Measure K is the $1.2 billion school facilities initiative approved by local voters. “Thanks to the voters of this community, this campus is now a reality,” said Board of Education Vice President Diana Craighead. She also thanked nearby residents of the school who endured three years of school demolition and construction. The school has 43 classrooms in seven buildings. The administration building/library, science building, two multi-story classroom buildings, gymnasium, lecture hall and food services facility all have high-tech, energy efficient features. 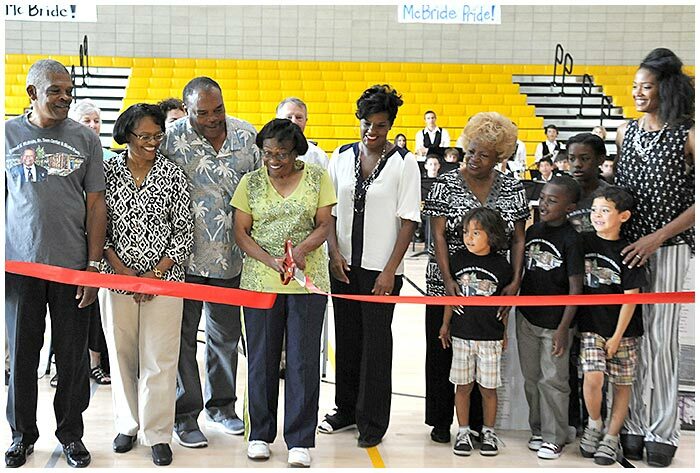 MCBRIDE PRIDE – Members of the McBride family dedicate Ernest McBride, Sr. High School at a ribbon-cutting ceremony in the school's gymnasium.